This census document shows the entry for Arthur Lund. Arthur was a friend of the Hamilton's in Tonasket, WA in the late 20's and early 1930's. He was a town founder and civic leader. His occupation is listed as President of the Bank. During this depression time he was a real help to Maurice and Elsie Hamilton and took a special interest in their oldest son, Darrel who was afflicted with a heart condition. Arthur Lund Hamilton was named after him. Arthur Lund "Art" Hamilton was the son of Maurice Lake Hamilton and Elsie Luetta (Galloway) Hamilton. Arthur was named after Arthur Lund of Tonasket, WA. 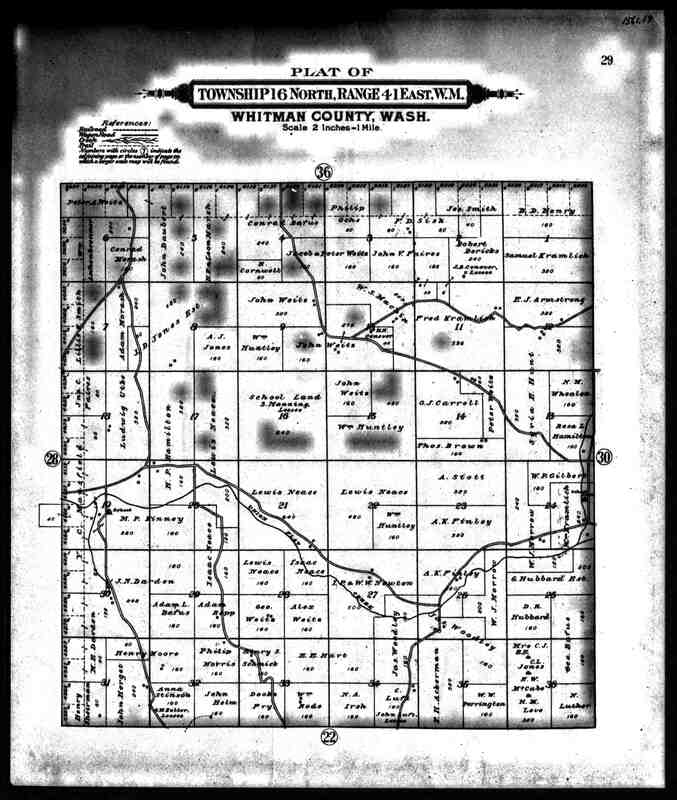 This image is from the work "Atlas of Whitman County, Washington" published in 1895 shows the map of Township 16 North, Range 41 East (T16N R41E). This confirms the location of Supplina Hamilton's homestead and his son Heman (H.P.) Hamilton. This map corresponds to other records and family memory. This atlas does not show a school on the south western corner of the property next to the Pangborn farm, but a school was built there and is shown in the 1910 version of the atlas. It was known as the Hamilton school and members of the Judd Hamilton family and other Hamilton children were known to have gone there. This image is from the work "Atlas of Whitman County, Washington" published in 1910 shows the map of Township 16 North, Range 41 East (T16N R41E). If you look at the extreme left of the map and between 41.50 and 41.12 you'll find the Hamilton School (marked 'School') and H.P (Heman) Hamilton's land. Supplina Hamilton died in 1905. Supplina owned the property that the school was on and the land on both sides of Union Flat Creek. This map implies that the homestead had been put under the name of his son Heman Hamilton or sold to someone outside the family by 1910. Heman's land is also clearly marked in the 1895 version of the atlas and his father Supplina's land was adjacent. In Supplina Hamilton's will (he died in 1905) he left the section of land he owned at that time to his wife, Jane. That section was noted in Supplina's will as being north of this location within T18N R42E. (As a side note: This is confirmed in this same 1910 Whitman County atlas where Supplina's widow 'Mrs. Jane Hamilton' is shown as an owner of a section of land north of this location within T18N R42E a short distance south of Saint John, WA and near land leased and some owned by her son Frank). As of June 2007 a well-kept old home still stands on the location of the original Supplina and Jane Hamilton farm house on the property on Union Flat Creek within T16N R41E. The Hamilton school is gone except for an old out building that is remembered by the locals in the area to have been a teachers or cooks house. Members of the Judd Hamilton family and other Hamilton children were known to have gone to school there. 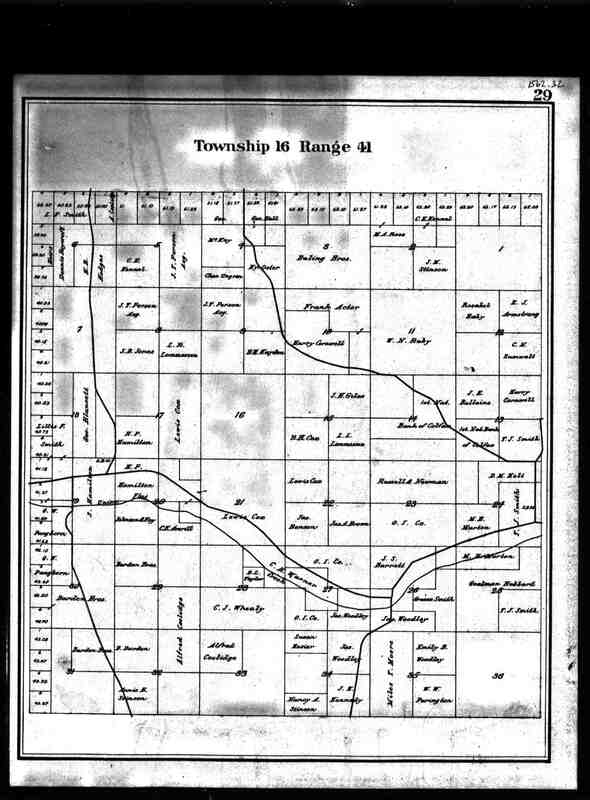 Note: on the far right of the map is the property of Rosa L. Hamilton. Rosa was the wife of Civil War Veteran William McCord Hamilton who was the brother of Supplina Hamilton. This property is on what is now called Edward Hamilton Road. Edward Hamilton is the grandson of Rosa and William Hamilton. Edward's property was at the northern end of the road on what was land that was originally owned by his mother's family, the Lairds. Edward Hamiton's son, Clarence Hamilton and family now live on that property. 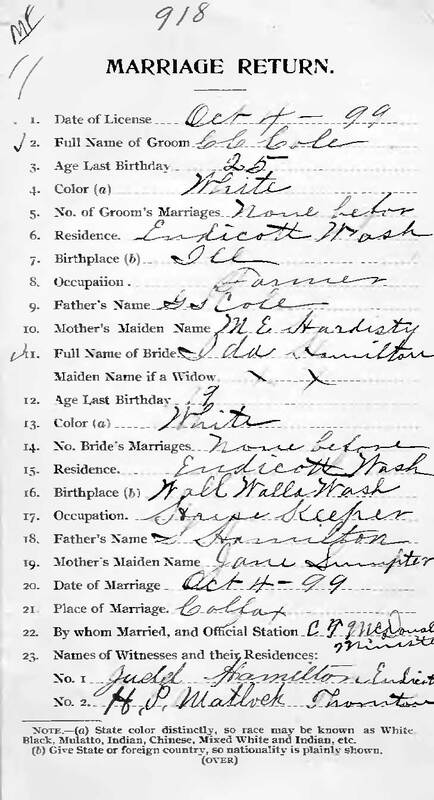 Birth Certificate of an unnamed baby girl born to Charles Oscar Hamilton and Adelaide E. (Cummins) Hamilton of St. John, Washington. Charles was the son of Duron Hamilton the oldest child of Supplina and Sarah Jane (Sumpter) Hamilton. This PDF file displays a representation of a blank page from the 1810 census. Use this document to understand what each column means when viewing the image of the actual 1810 census document. This PDF file displays a representation of a blank page from the 1830 census. Use this document to understand what each column means when viewing the image of the actual 1830 census document. Note: Research suggests that Chancey is another name for "Amasa" the father family of Charles "Charlie" Amasa Galloway. Charles Amasa and Grace Galloway. California State Voter Rolls: 1934-1944 (p. 38). Residence: 1004 G Steet, Marysville, CA. Occupation: Miner. Charles was the father of Elsie Luetta Galloway who married Maurice Lake Hamilton. Charles Amasa and Grace Galloway. 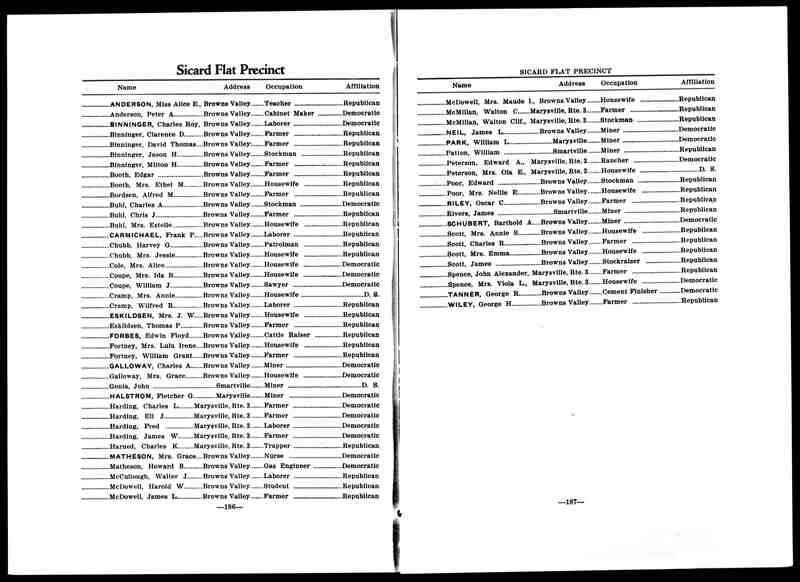 California State Voter Rolls: 1934-1944 (p. 53). Residence: 1222 Pine Steet, Marysville, CA. Occupation: Miner. Charles was the father of Elsie Luetta Galloway who married Maurice Lake Hamilton. Charles Amasa and Grace Galloway. 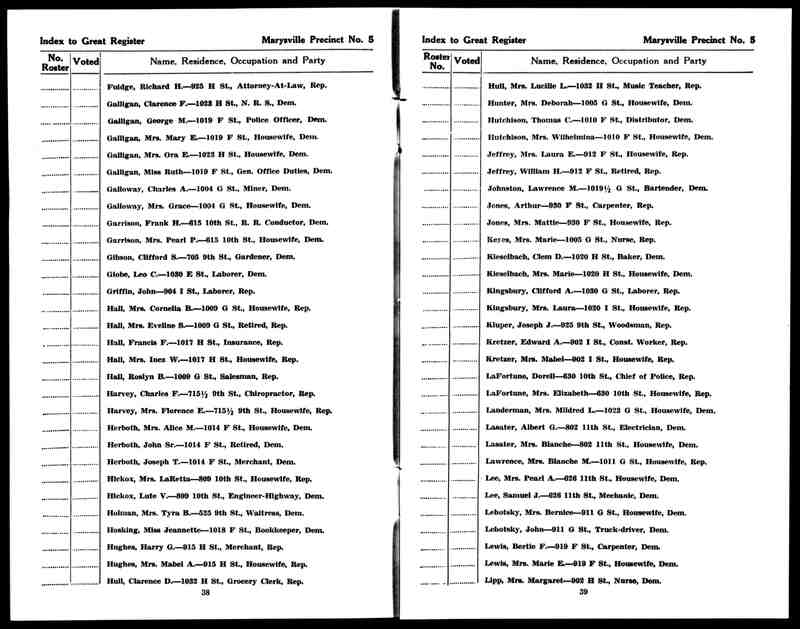 California State Voter Rolls: 1934-1944 (p. 81). Residence: 220 & 220 1/2 7th Steet, Marysville, CA. Occupation: Miner. Charles was the father of Elsie Luetta Galloway who married Maurice Lake Hamilton. Charles Amasa and Grace Galloway. 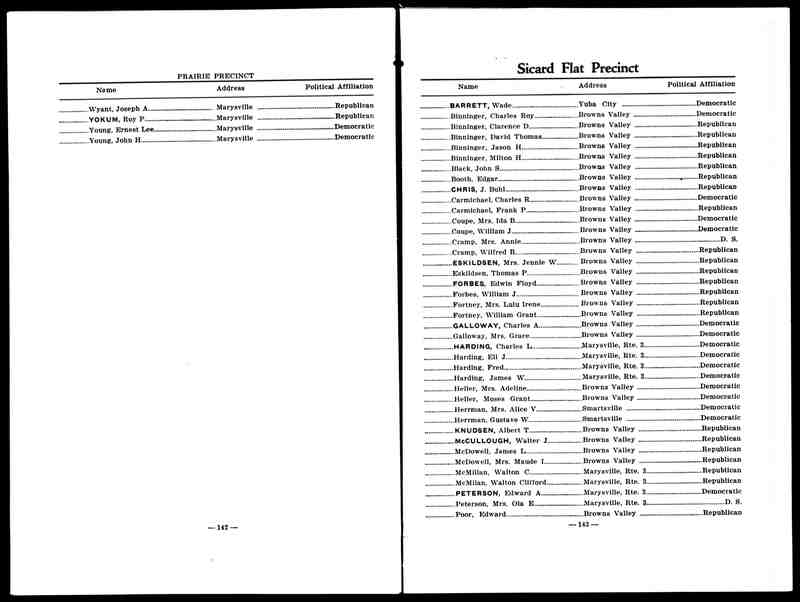 California State Voter Rolls: 1934-1944 (p. 186). Residence: Browns Valley, Sicard Flat Precinct, Yuba County, CA. Occupation: Miner. Charles was the father of Elsie Luetta Galloway who married Maurice Lake Hamilton. Charles Amasa and Grace Galloway. 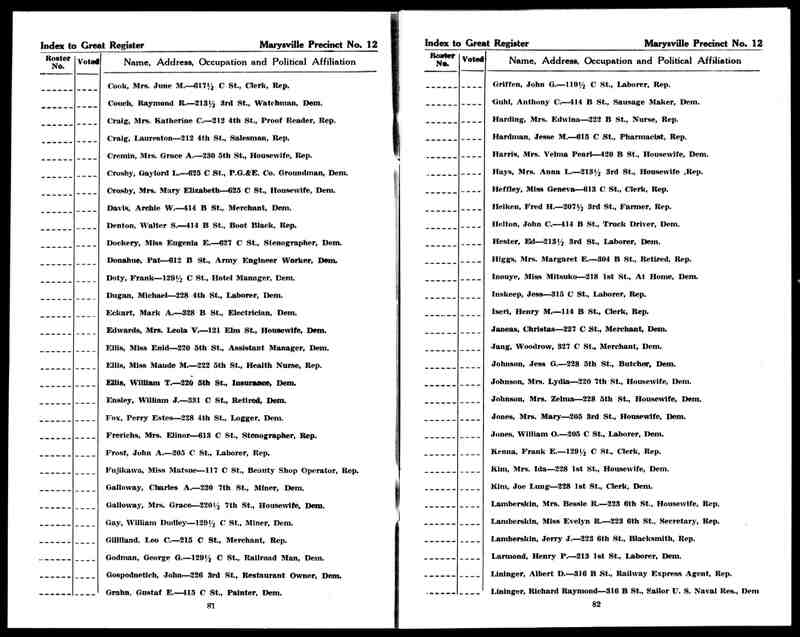 California State Voter Rolls: 1900-1932 (p. 143). Residence: Browns Valley, Sicard Flat Precinct, Yuba County, CA. Occupation: Miner. Charles was the father of Elsie Luetta Galloway who married Maurice Lake Hamilton. This is an amazing find from Washington's Digital Archives. Here it is: Lillie (Lillian Mae) Ramsay's marriage license to Charles 'Charlie' Amasa Galloway, dated March 11, 1903. They were living in Wauconda, WA and the license was issued before the Justice of the Peace in Republic, WA. Lillie was only 16. Charles was 21. Their marriage did not last and by Sept. 1907 Lillie was married to William Fee. We find Charles married to his second wife, Grace, in the 1910 US Census living in Republic, Wa. Elsie Galloway was born (along with a sister Effie) to Charles and Lillie. Elsie would be raised mostly by her father's family, before marrying Maurice Lake Hamilton in Okanogan, WA in 1920. The marriage certificate confirms the spelling and middle names and maiden names of Lillie's parents and Charles' parents. 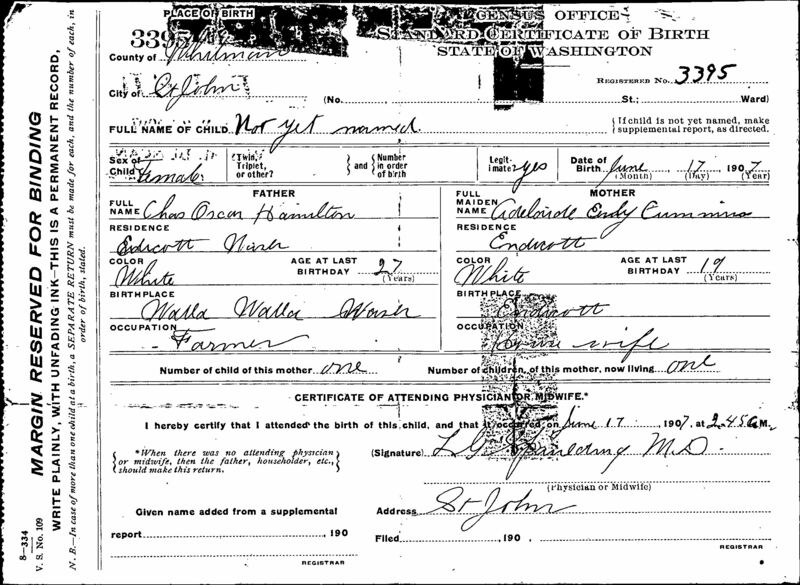 The document also confirms that Lillie was born in Marion in Pierce, County, Washington in 1887. Lillies' parent and older siblings are enurmerated in the Puyallup Valley in the 1880 Federal Cenus for Washington. They had come to Washington from Cherokee, County, Kansas where they appeared in the 1870 Census. 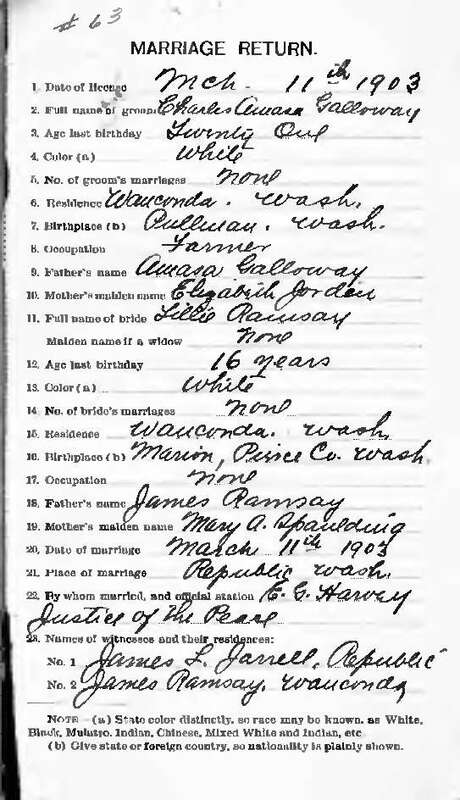 23) Charles and Grace Galloway - 1910 US Census Ferry County, Republic WA. Charles 'Charlie' Galloway was the father of Elsie Luetta (Hamilton) Galloway. Grace was Elsie's step mother. Elsie's biological mother was Lilly Ramsay who latter married a man from British Columbia with the last name of Fee. Charles "Charlie" Amasa Galloway was 36 in 1918 and living in Wilbur, Washington. He may have had his second wife Grace with him and his daughter by his first wife, Elsie (Hamilton) Galloway. He lists Grace as his 'nearest relative.' He lists his occupation as 'Laborer' though he was then unemployeed. The Galloways, Charle and Grace and including Elsie Luetta and Charles' mother, Elizabeth, would be living in Spokane by the 1920 Census. Ida (Cole) Hamilton was a daughter of Supplina Hamilton and Sarah Jane (Sumpter) Hamilton. Laura Harrison's grandparents collected documents published by the Okanogan County, Washington Historical Society. This PDF file contains two pages from the publication: "Valley Memories of Tunk Creek, Chewiliken and Riverside." Charles W. Spaulding (C.W.) was the brother of Mary Adelaide (Spaulding) Ramsay, the wife of James W. Ramsay and grandmother of Elsie (Galloway) Hamilton. Charles W. Spaulding was an unmarried brother of Mary Adelaide (Spaulding) Ramsay. Mary was the mother of Lillian (Galloway / Fee) Ramsay who was the mother of Elsie (Galloway) Hamilton. Clarice Hamilton was a daughter of Oscar Hamilton and his second wife Minnie Miller. Clarice was a granddaughter of Duron Hamilton. 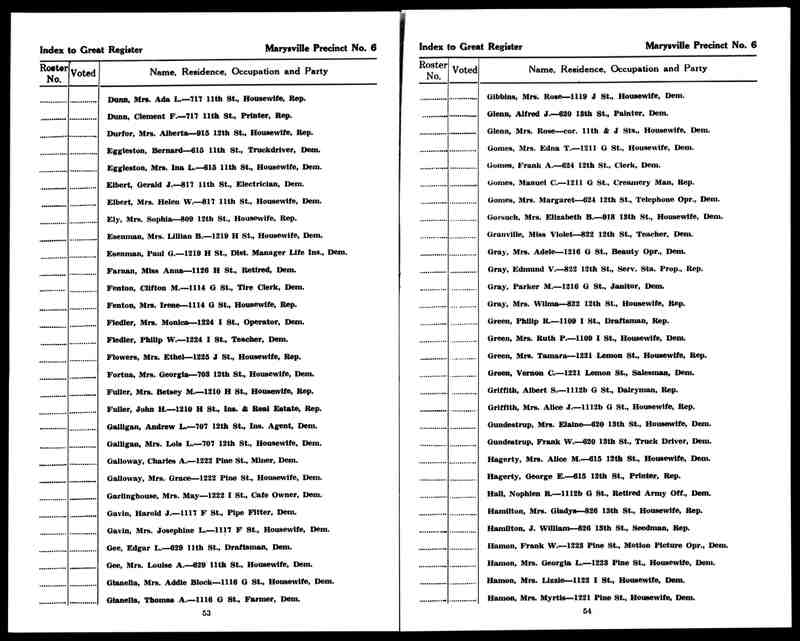 This document contains exerpts from the book, "Combined History of Shelby and Moultrie Counties, Illinois", 1881 edition. The pages exerpted discuss the history and early settlers of the Ash Grove Township in Shelby County. Among the settlers are Robert Templeton. Robert emigrated from North Caroline to Shelby County in 1828 and his family were some of the first settlers in Four Mile Grove. Robert's Great Granddaughter's were Laura Annette and Julia Aletha Templeton (daughters of Greenberry Shields Templeton and Nancy Jane McCarty). Laura Annette was the wife of Judd Hamilton. Julia Aletha was the wife of Judd's brother, Frank Hamilton. Judd and Frank were sons of Supplina and Sarah Jane (Sumpter) Hamilton and finished their days in Washington State. Danny was the son Maurice Lake Hamilton and Elsie Luetta (Galloway) Hamilton.